You must make reservations at least 5 minutes in advance of the time at Inca Social. *The garage by the District Taco offer free parking. *Street parking is Free after 5:30pm & Free on weekends. *Harris Teeter Parking lot that gives you free two hours of parking which is great if you are coming for lunch. *Metro Parking behind the restaurant is FREE after 7:30pm on weekdays and Free all day on weekends. For catering inquiries please call us or email Events@incalatinkitchen.com. Private events, Corperate events, Birthday Parties are all welcome and all are handled differently and custom to each event. To reserve your event at Inca Social please call us or email us at Events@Incalatinkitchen.com. 23 Craft Beers ( 20 which are always local ) are always available on draft and you can find them on the website Incasocial.com or on Untapped mobile app. $5 Beer & Wine and $6 cocktail & food specials available. Wonderful experience, would certainly recommend. The food, drinks, and atmosphere were all exceptional. My Fiancee is Peruvian and I have been to Peru numerous times . I ordered Tacu -Tacu which was excellent . My fiancée enjoyed her meal as well . The owner came to our table and introduced himself and bought us and order of Ceviche which was excellent . Ceviche is a big thing with my Fiancee's family . they get together and make it all the time and critic each other on it . She loved this ceviche . Inca Social gets an A+ in our book . Food and drink were awesome. I normally like the standard beer. I had “tried” 5 beers and thoroughly enjoyed everyone. They weren’t your standard beers; they have a variety of IPA’s and sour beers I normally wouldnt have. The quality and quantity of food absolutely blew me away as well. Filipe was absolutely amazing. He is a stud. Every table was detailed and made a seemless transition for every customer. I highly recommend this establishment. Well done Inca Social! If you have tried the authentic Peruvian food you will be disappointed: 1) the "pisco sour" was watered down and tasteless. 2) The ceviche was not good either. Fish was overcooked, sweet potato came from a can. The lomo saltado and pork chicharron were okay. The hot sauces, the flan and service were good. They have a good selection of beer. Food was very tasty and had a great local beer list, but they need to work out their service issues. Extremely slow to get an order in and get out drinks & food. Best food ever!! Great Service Manager and servers make us to feel very special.. Try INCA Balls and Ceviche! Food was not good. Inexperienced staff. Long way to go for the new place. Really neat to see Peruvian dishes on a menu in a new and modern area like Merrifield/Vienna. I went to Inca Social on Feb.16,2019 around 5pm. I do NOT recommend this restaurant if you are familiar or if you tried and liked Peruvian food before. Why did NOT I recommend Inca Social? Because their food is everything BUT PERUVIAN FOOD. 1.Classic Ceviche has a white cream juice that tastes yogurt or cheese. Classic Peruvian ceviche has lemon only. Also, the tiny piece of sweet potato tasted powder cinnamon. 3.Empanadas kids, it came with HOT salsa. Little kids do not eat spicy hot salsa! Food was great, well seasoned and with a lot of flavor but service was awful. Service was awful, food and drinks took forever to be prepared. Drinks got confused at some point and another drink got to our table by mistake. We waited for an hour before the food got to our table. Waitress kept forgetting to bring the drinks and constant reminders were needed. We asked for some yellow sauce and only one side was brought to the table quite stingy a little bit! Great food and friendly staff. However, still working out the kinks on service. Waited a long time after being seated to have any order taken and in between courses. I’m confident they will work it out and everything will be great. We made a reservation, yet had to wait 20 minutes past our reserved time. They did not "reserve" a table. The food was good, but overpriced. Good beer selection. Seating was cramped, was squished between strangers. The noise level could be lowered a little. Overall, good food and atmosphere but overpriced and poor planning. Ils viennent d'ouvrir leurs portes...la cuisine est très bonne. Ils ont besoins un peu de temps pour regler le reste . Great new place, such a great improvement over what was there! We shared a bunch of apps - loved the Inca Balls & the wings. We shared the Lomo Saltado and Arroz Tapado entrees both delicious and would recommend. We really wanted to try the choc empanadas and churros but they were out, hopefully the next visit they will be available. Our one negative comment would be the menu font is so tiny, made it very hard to read. Great food and great vibes but it took over an hour to get our food served and 30 minutes to get our apps. The servers were very friendly and attentive, the ambiance and decor is really interesting, and the food was cooked well and was flavorful. We will define back! The food was delicious and we really liked the ceviche. Once they have been operating for a few weeks, I think the service will improve. They just opened and were packed so I think they just need to find their rhythm! Great drinks, great food, great party. 10/10 would try again. Amazingg!!!! Hostess sat us right away, the waitress Allieon accomadated us when we added 4 people to our party, food was phenominal and such a fun atmosphere!! 6 starss if i could! Food was delicious. Drinks were good. Service was terrible. Only reason I’d go back, is for the food. It’s delicious enough to tolerate the terrible service. Overall a good dining experience. It is virtually impossible to find a good Peruvian restaurant in the Northern VA/ DC. 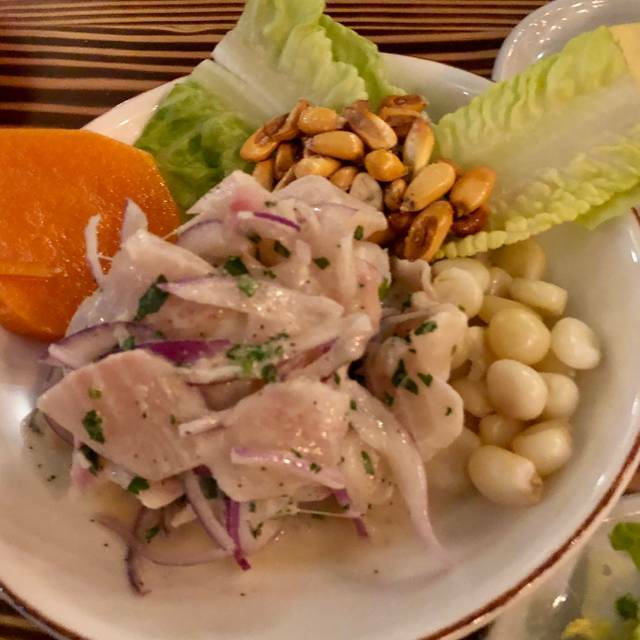 Most food is always mediocre and the reviews are unreliable as the clientele might not be fully aware of what authentic Peruvian food should taste like. I have to say this is one of the more authentic tasting Peruvian food which comes second to only one other restaurant in Northern VA and by far surpasses any highly rated Peruvian restaurants in DC. Presentation and portion sizes were spot on. It would be nice for them to have a decent happy hour special considering the more social ambiance. Prices were slightly higher than hopped for but considering the area and rates they were fair. The Lomo Saltado, Ceviche and Pisco Sour were all satisfactory which is hard for any Peruvian restaurant to accomplish. We were a group of 6 and had no major complaints. Our waitress was not very attentive but I assuming she was new and might not have much experience. She was very respectful and friendly. I look forward to visiting again when the restaurant has officially opened to see if there are any changes to the Menu and or a Happy hour special (especially for the food). Overall, it’s a good dip in the pool of what Peruvian cuisine. I’ll have to say the authenticity of the cuisine is lacking and the flavors are bland. If they can tweak those things with the food and dining experience would be complete. Overall service was great, food took a bit too long to come out. Understood as the restaurant is still in soft opening. Critiques of certain plates I had, ceviche was very acidic and lacked the flavor balance of acidy and the rocotto pepper. Bistec al pobre was well cooked and plated. Best feature and flavor was the French fries. The meat itself lacked flavor but was well cooked. Missing that Bistec flavor and juice. I would say if you want a nice dining experience with a comfortable, vibing atmosphere this a good place in the area. Menu variado y agradable. Resalta su Ceviche de pescado. Buen ambiente y atención. We had a group of four on a Friday night. We ordered a few beers, pisco sour and a chicano. They were all good drinks but the pisco sour was very sweet though. Next we had an appetizer, chicharron de pollo which was crispy on the outside but the chicken was dry on the inside. It was overcooked and a little tough. The ahi sauce was very good. For our entres, we had Lomosaltados and Arroz con Pollo. The Lomosaltados tasted very good and was a good portion. The Arroz con Pollo was not as good. I've had this meal many times at other places and the chicken was not a good cut of meat and the rice was dry. This was disappointing as we are also a Peruvian family. We wanted to split the check between couples and they were not able to do this. Overall we had a good time but I think some adjustments need to be made. The wait staff was very good. We will definitely come back and try it again. Just in the soft opening phase, this place has it together. The owners and management have plenty of experience and it shows. The beer list is on point. 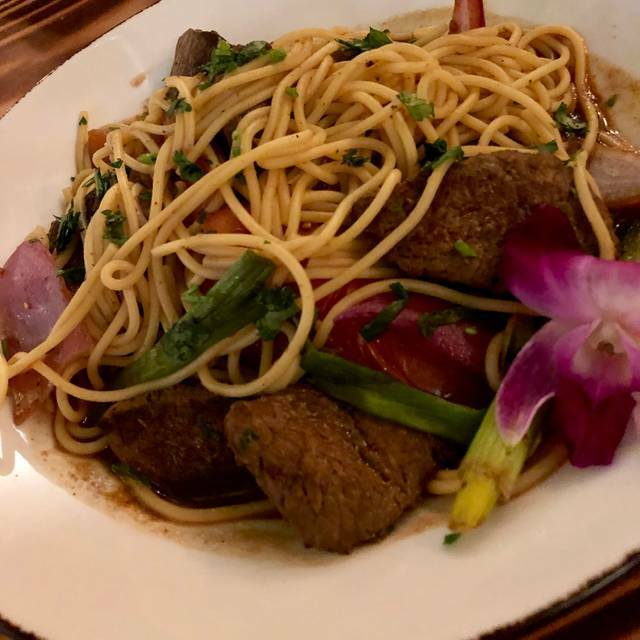 The logo saltado is really delicious.